Your time is better spent doing what you love. Always. You learn a lot about other people and the relationships you find yourself in and sometimes it’s a pattern. It’s weird. You become better at understanding others in a more of an emotional sense. A good thing! You realize that sometimes two people just aren’t right for each other, but you accept it, move on, and that’s that. You realize you need to be patient when it comes to your career and success. BUT You learn to walk away from the things that don’t leave you satisfied with happiness, and then choose to pursue what keeps you smiling. You value close friendships more than ever. You leave drama behind. You are more thankful for your family because they will always be rock solid. You begin to acknowledge the fact that a different location wont change your feelings or allow you to start over. Your location doesn’t control your happiness — YOU do. Somewhere along the way, you grow up a bit. More than anything, I’ve discovered that your 20s are about trials and tribulations. The best you can do is to just be yourself. Only try to change what you CAN control… and the rest? Whatever! Simply put, we all can be better than the people we were yesterday. After all this, I’ve also realized that growing up means enjoying thing that are actually HEALTHY for your body and mind. Especially food that makes your body feel good on both the inside and out. Unfortunately, inhaling 5 cookies at once won’t bring you any sort of happiness. Trust me on this. I’ve had several bad experiences with Girl Scout Cookies. Shhhh. So what should we be eating? Nutritious things from the earth! This means unprocessed whole grains, fruits, vegetables, healthy natural fats, and things that don’t come from a drive-thru or a box. If this is a weird or foreign concept to you, then please plan a trip to the farmer’s market and clear out your cabinet. I’m going to teach you how to cook and bake oddly delicious things. AND it’s going to be fun. 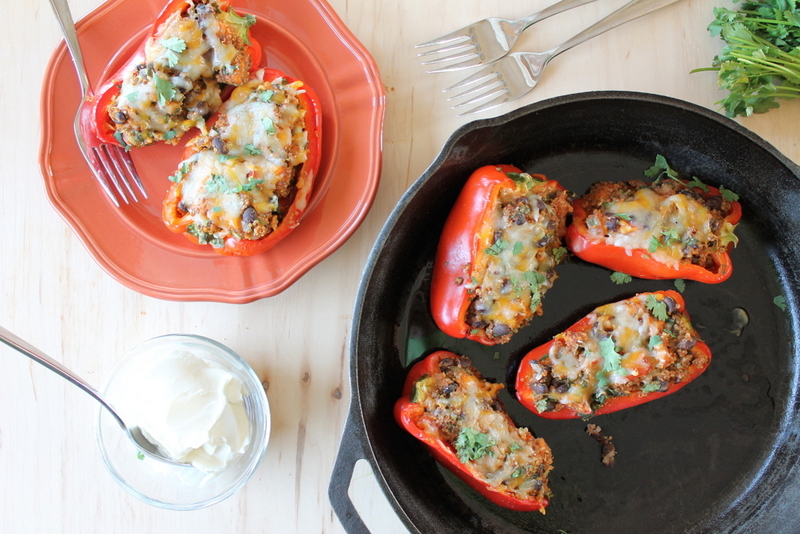 That’s right, we have to learn when to say no to cookies and when to say yes to mind-blowing delicious vegetarian stuffed peppers like these. Hehe. You guys know me and my obsession with margaritas and Mexican food. Like hellooooooooo… marqs + chips + guac complete me. I love the flavor profiles of Mexican food so much that nearly every dish I create uses garlic, jalapenos, cilantro, and some sort of chile based sauce. Definitely no apologies there. But today I wanted to give you a vegetarian (and gluten-free!) 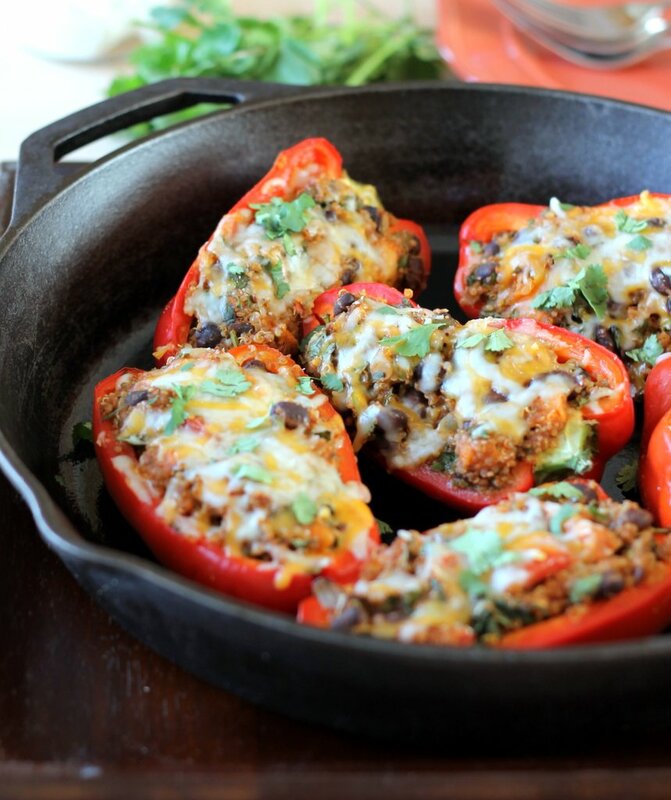 stuffed pepper recipe — packed with flavor but WITHOUT mega calories! They’re filling, gorgeous, and probably one of my favorite meals I’ve had in quite sometime. You must make them! SERIOUSLY. I find that they are perfect for just about anyone. Make them vegan by leaving off the cheese (or use vegan cheese), plus they’re already gluten-free! 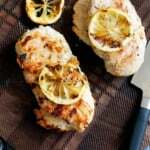 If you want an extra satisfying meal, add in a cup of chopped chicken breast to the mix. 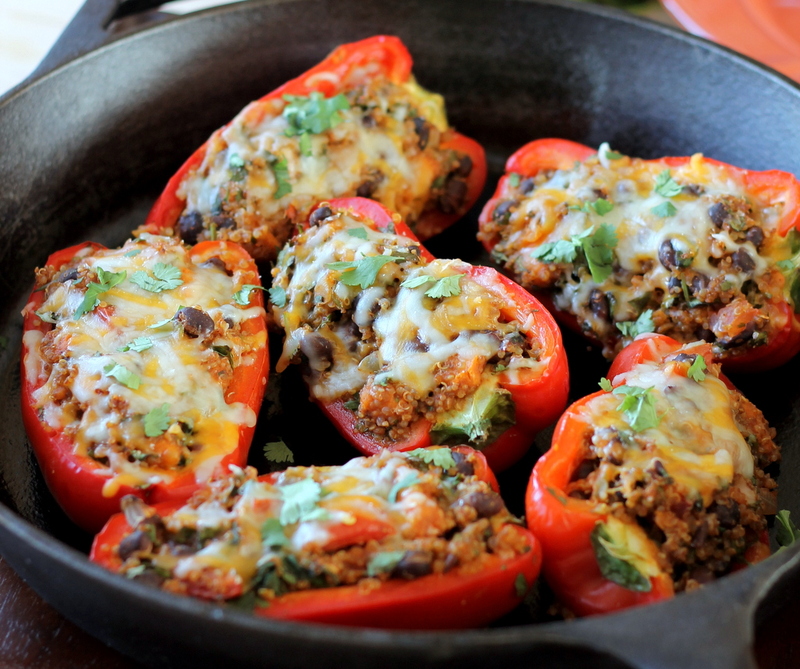 I think you’ll get the idea with these totally amazing vegetarian stuffed peppers! 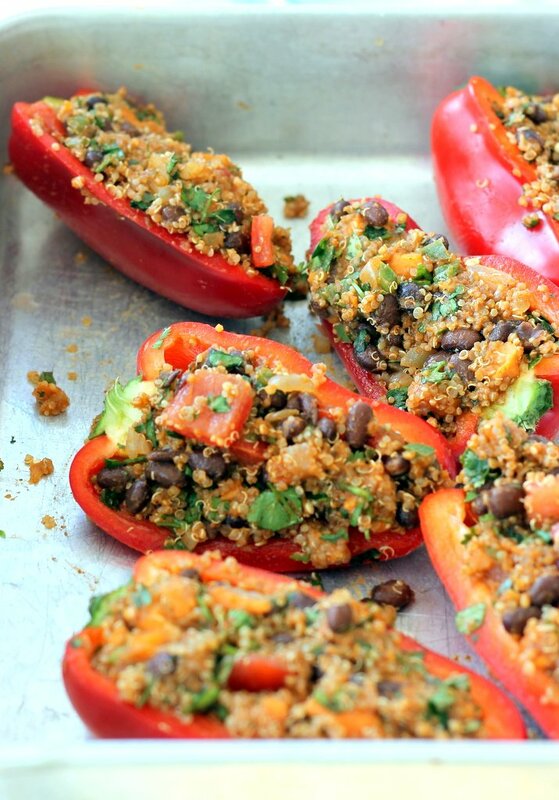 Load them with guac and low-fat sour cream or greek yogurt. 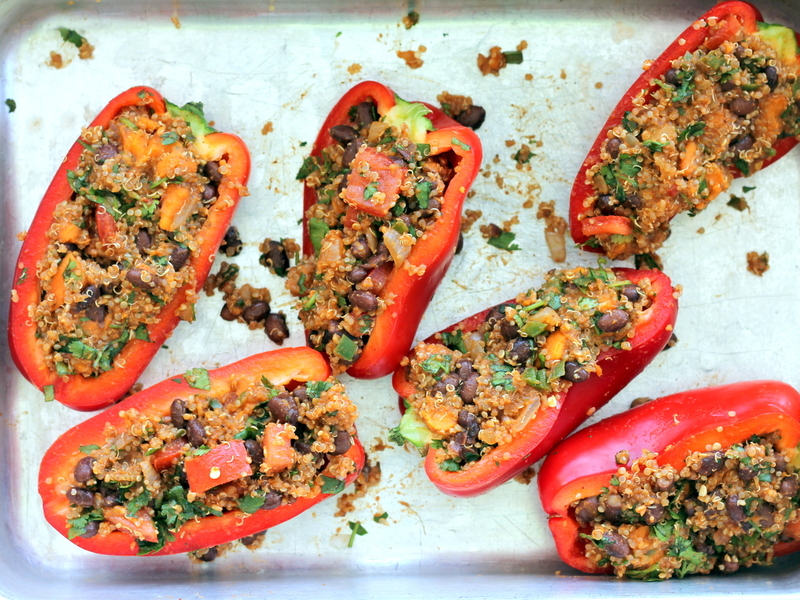 59 Responses to "Black Bean, Sweet Potato, & Quinoa Stuffed Bell Peppers"
I love these. These will be a great healthy dinner. Also, I agree about gaining wisdom. I’m just now starting to really appreciate things. This sounds like a wonderful combination of flavors and it’s healthy too! 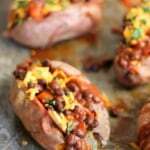 I love the idea of putting sweet potatoes (my fav!) in the peppers! Look forward to giving this one a try! Yum! This looks amazing. I have recently changed my the way I eat and lost 15 pounds. Thank you for putting the nutritional info at the bottom! This helps me so much! Thank for coming up with such yummy, creative, healthy food! Is the serving size nutrition for a whole pepper or just one half? Thanks! Looks yummy! I love love love Mexican food but it always makes me feel so gross after eating it (I’m looking at you, chips and queso). So this is the best of both worlds! Looks yummy! Is the nutritional information based on 1 full pepper or the half stuffed pepper? 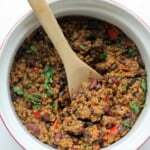 Very flavorful and super easy to make. Thanks for posting it. I’m hoping that if I just keep making your recipes you’ll take the hint and come move in as my personal chef. 🙂 C’mon…Montana is beautiful! No? Ok. Well, we had these for dinner last night and loved them. I did add some elk italian sausage to keep the hubs happy, but it seemed like a good addition. Oh….and and and….I topped them off with your chipotle yogurt sauce and some diced avocado. DE-VINE. Had one again for lunch today in fact. 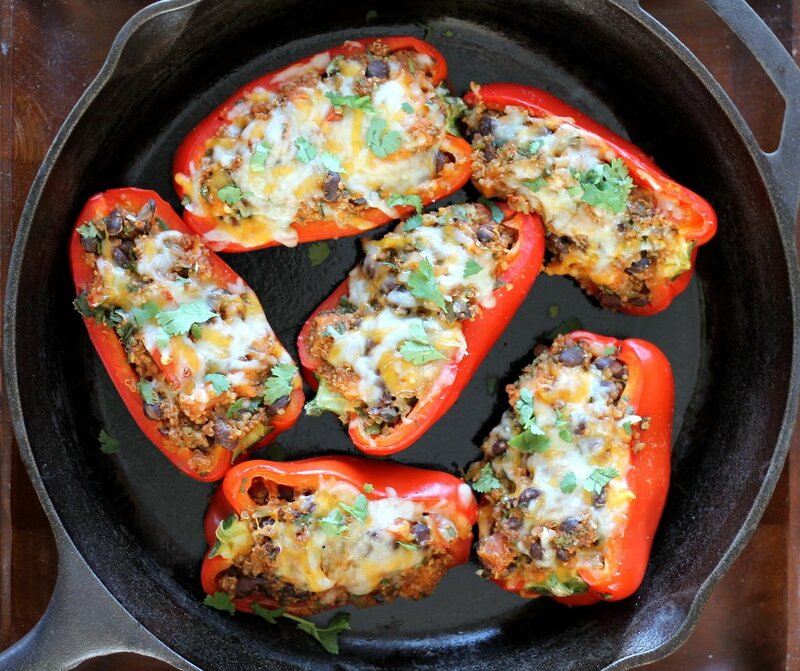 It could have been the addition of sausage, but I had enough stuffing for a 4th bell pepper….and trust me, I stuffed those suckers high. Just FYI. Comments like these make my day! YUM! I made these yesterday (adding chicken). Very Good! I just made them for my grandparents and they loved it!! It’s ridiculous, I think I’ve made about 15 of your recipes and they were all amazing!! Your recipes remind me why I love to cook and (especially) bake. I'm making these tonight! The photography of this dish is absolutely stunning! Great recipe, can't wait to make these! So gonna try this one. 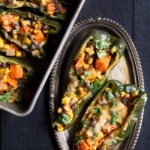 Just made these tonight, added corn. YUM! My one year old, who is not a meat lover, my mother and I, who are, all really loved this. I omitted the jalapeño for my daughter. 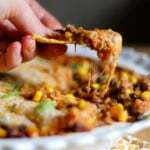 This was a fantastic recipe sure to satisfy vegetarians and meat eaters alike. My only criticism, which really isn’t a criticism at all, was that I had quite a bit more filling than I could fit into the three peppers but I don’t mind the leftovers at all. Thanks for sharing! These are very good and easy on the eyes! I think they need a little more zing though so I will be adding salsa in place of the tomatoes and a lot more cilantro – love cilantro! Thanks for the great recipe! 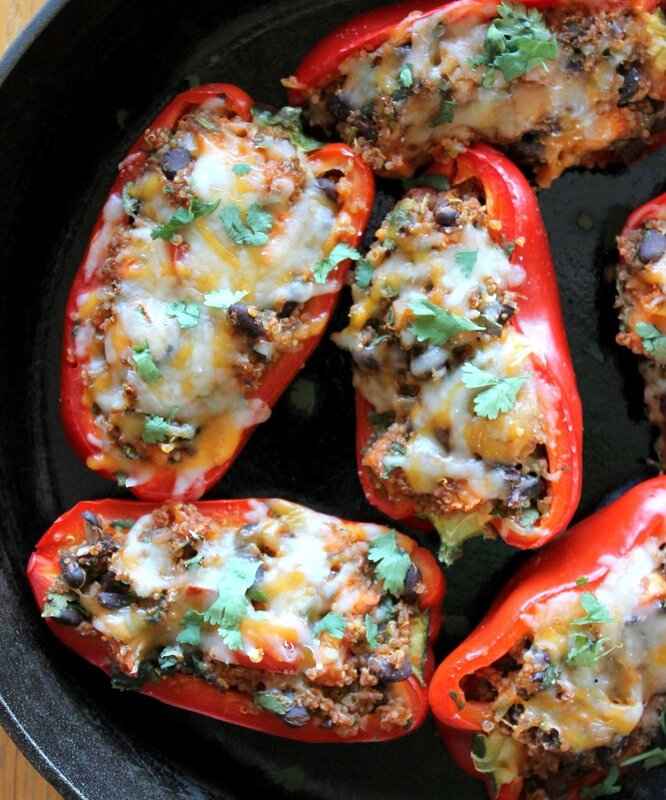 We love this recipe and have shared it with our readers this week! See your recipe we shared on Reciperedoblog.com. If you have other healthy recipes you would like to share, please send them to recipes@journeyintowellbeing.com. Thanks! Hi! 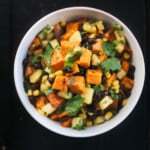 I made this recipe yesterday and LOVED it! The only thing is that we made way too much of the filling, so I was wondering if it could be freezed? or how long does it last in the fridge? thanks! I linked to my blog, because I loved it so much! I made this this weekend to eat for lunches this week. It is SO delicious! Thanks for sharing!!! These were very tasty. I am just now finding out how wonderful sweet potatoes are without slathering them in butter, sugar and spices. I did not add the cheese as I’m trying to avoid dairy these days and I also added extra cilantro because I love it. I was pleasantly surprised at how good they were. Even my picky 13 year old enjoyed the quinoa filling. Thank you for this recipe! My boyfriend and I made this recipe last weekend and loved it!!! I really like how the quinoa gets a little crunchy on top when you put it all in the oven- like a twice baked potato but really good for you! Thank you for the recipe we’ll definitely be making it again! The ingredient combination sounds interesting. And yes, it does sound healthy. On a side note, I would prefer to see 1 or 2 great photos instead of the same shot 6 times. I’m happy for you that you realized relatively early on in life, that eating healthy doesn’t have to be uninteresting or tasteless; however, I am at a loss as to why there is so much chatter. Because this is a blog! Thanks for your input though. 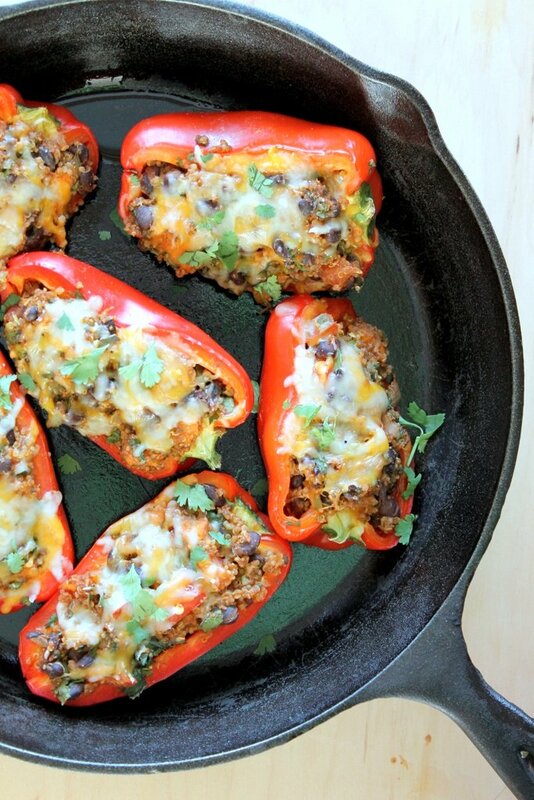 Looks delicious and I would love to try this recipe but before I do, please can you say whether the nutritional info is for one whole pepper and the recipe serves 3 or if for half a stuffed pepper and it serves 6? 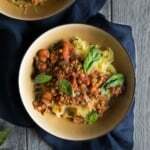 I was wondering about the nutrition too, so for all those who asked, I entered this into My Fitness Pall and it looks like the info on here is for one half, great recipe! Monique! This was ahhhmazing!! My husband and I ate it all up and raved about it. Nice work! I left out the pepper and red pepper as well due to the fact I added mild italian chicken sausage and it had enough heat. Will definitely be making this again! Absolutely delicious recipe! Not sure if you’ve heard of them, but I used Zen Spice Traders (www.zenspicetraders) Vietnamese Phú Quốc Black Pepper and their Roasted Thai Chili to make this even better. The flavor profiles are very complementary and work well together!